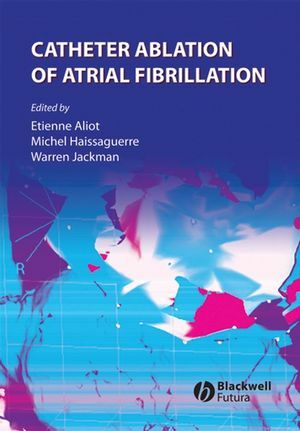 In this text, internationally recognized authors explore and explain the advances in basic and clinical electrophysiology that have had the greatest impact on catheter ablation of atrial fibrillation (AF). Richly illustrated by numerous high-quality images, Catheter Ablation of Atrial Fibrillation will help every member of the patient care team. Part 1 Fundamental concepts of atrial fibrillation. Chapter 1 Anatomy of the left atrium relevant to atrial fibrillation ablation. Chapter 2 Mechanisms and significance of fractionated electrograms recorded during atrial fibrillation. Chapter 3 Computer simulation studies of atrial fibrillation. Chapter 4 Experimental and theoretical insights into fundamental mechanisms of antiarrhythmic drug actions on atrial fibrillation: prospects for improved pharmacotherapy. Chapter 5 Mechanisms of atrial fibrillation in animals and humans. Chapter 6 Three-dimensional images in catheter ablation of atrial fibrillation. Chapter 7 Signal processing of fibrillatory electrograms. Part 2 Practical approaches in atrial fibrillation. Chapter 8 Emerging technologies in the treatment of atrial fibrillation. Chapter 9 Techniques targeting the pulmonary veins. Chapter 10 Techniques of linear lesion for atrial fibrillation ablation. Chapter 11 Ablation strategies in paroxysmal atrial fibrillation. Chapter 12 Ablation strategies in chronic atrial fibrillation. Part 3 Special challenges in atrial fibrillation. Chapter 13 Diagnostic algorithm of atrial tachycardia following atrial fibrillation ablation: importance of localized reentries. Chapter 14 Catheter ablation of atrial fibrillation in patients with heart failure. Chapter 15 Morbidity and mortality of ablation versus drugs. Chapter 16 Atrial mechanical function after atrial fibrillation ablation. Chapter 17 Surgery for atrial fibrillation: from scalpel to catheter . . . and back?.